Hear John Freire talking about his Model III converted to a Model IV (12.6MB MP3) and about using an AM radio for sound effects for his TRS-80 (.8MB MP3). 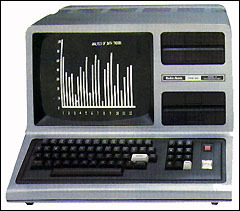 John Freire came by the DigiBarn in December 2004 bringing this wonderful donation, a sterling TRS-80 Model III (3) which was converted into a Model IV (4) by Radio Shack for him. Indeed this is a very early Model III (number 133) but it has internals of the Model IV (more RAM etc) but retains the silver color of the III (the IV was white). I remember seeing this silver baby at our college when I started in computers in 1981 but it was only accessible to the system operators of our PDP-11/34 (I was jealous). It seemed to be a real computer with the built in keyboard and floppies. The DigiBarn's Model III is a relatively rare unit in that it does not have floppy drives. I was told that this was an option. I am not sure how useful this would make the unit but perhaps it was operating with built-in ROM BASIC. I know many people have contiunously bad-mouthed the TRS80 (me included), but this computer holds a place in my heart as it was the first computer I ever got real experience with and learned to program on. My elementary school had a room full of these computers (about a dozen) and durring my time there I got to visit the computers about once a month to once a week on average. My impressions of these machines were that they were poorly designed to be used in a school. ANY company that creates a big orange reset button on a grey bland keyboard is asking for trouble. You try being a young child in school in front of a rather boring computer and NOT press the orange button out of boredom! This computer did do one thing for me though, I learned the fundamentals of programing in a language called Snake. Moral of the story? No matter how crappy a computer might be it will inspire some people that don't have a computer of their own to learn more about them. Even though I have chosen a differnet career than programing some of my fondest memories are of taking programing course later in high school and having fun with the network and the programs that I made that were exactly part of the course, and I would of never taken any of those classes unless I had met up with the TSR 'trash' 80 in my early school years.